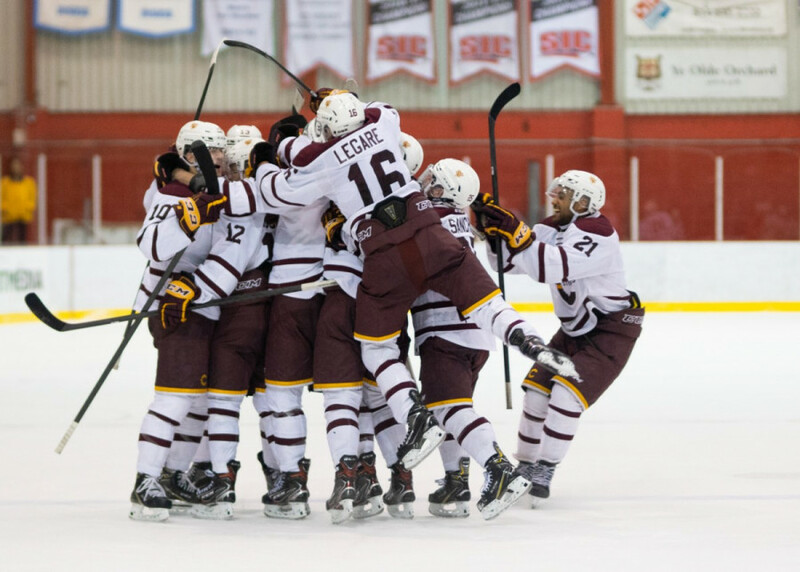 The Stingers celebrate after an overtime win Photo Elisa Barbier. It was a test for a new look team that ended the first semester on a five game win streak before adding eight new players. Could they play with the best teams in the league? Or would they fall back into the inconsistency of the early part of the season? They passed with flying colours. The Stingers swept the weekend, picking up four key points. “When you play those two teams and you manage to get four points, it means you’re right there with them,” said head coach Marc-André Élement. The wins also helped the team stay competitive in the very tight OUA East standings. Second and seventh place in the league are separated by just six points. Thanks to this weekend’s wins, Concordia is in the thick of things with a game in hand on most of the teams around them. With a win in their next game, they’ll sit just a point out of third place. The team is in a completely new place. Less than two months ago, when they played Ottawa for the first time, they were trounced 8-1. This time they matched them step for step all night. Philippe Sanche steals the puck en route to a win in extra time. Photo Elisa Barbier. Penalty kill? The Stingers killed off every man advantage that Ottawa got. Powerplay? The Stingers tied the score seconds into their first powerplay chance of the night. Stingers goalie Anthony Dumont-Bouchard stonewalled the Gee-Gee’s for the second and third period. The defense was solid and the Stingers’ forwards created chances. The Stingers simply played a complete game. “I think it says a lot about the players we brought in. Without knocking the team from before Christmas, I feel like we have a lot more depth behind us,” said Stingers defenceman and alternate captain Carl Neill. Neill thinks the team’s recent success is in great part because of the fact that these new players were starting to click and find their feet in a brand new league. While the new players are certainly doing their jobs, the win against Ottawa would have been impossible without the team’s most experienced player. Captain Philippe Hudon was a force, scoring both Stingers goals in regulation and playing a strong role in the defensive side of the game that forced the game deciding shootout. 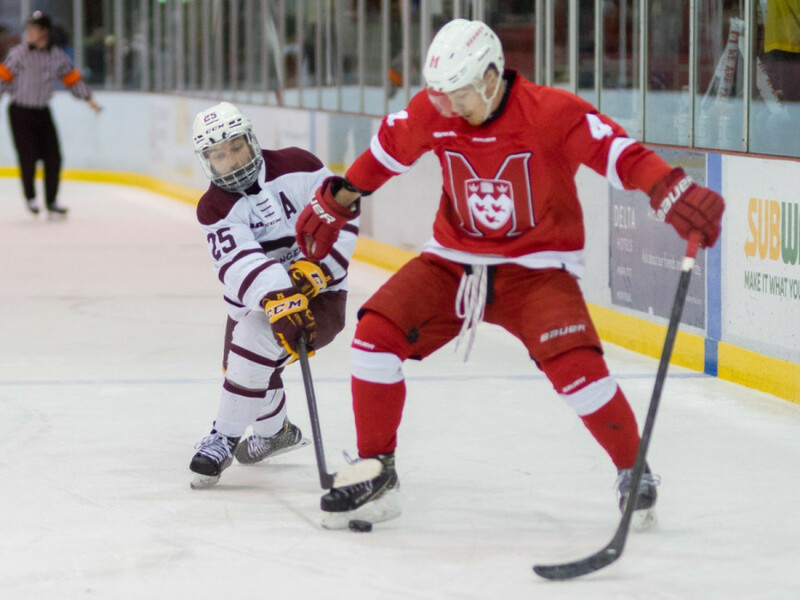 He set up the late game tying goal the night before against McGill as well. With the regular season winding down, Hudon is trending up. That’s not new phenomenon though. “It feels like history is repeating itself. At the dawn of the new year, it’s like a switch that just turns on and I’m finding the back of the net. I’m finding my groove a lot more,” said Hudon. His line with Philippe Sanche and Hugo Roy looked as dangerous as ever against Ottawa, creating chances all over the ice. The combination of three powerful shots, strong defensive games, speed, and hockey sense make for a dangerous line, on which Hudon is often the driving force. With just eight games left before the playoffs begin, Hudon and his team are certainly trending in the right direction.